Procedure Correcting smart card details online Tnpds website is described in Tamil in the video given at the article. 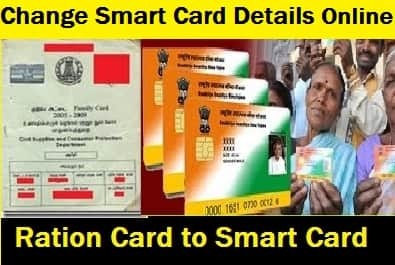 Tamil Nadu Government started giving the smart card instead of old Ration card. The old ration cards will be converted automatically in to the smart ration by the government. The existing ration card holders will receive an PIN on their mobile and they can collect their smart ration card from their nearest distribution center by showing the SMS or showing the old ration card. Tamil Nadu government announced that general public can check their details online before Smart card getting printed. Watch the video at the article to get instructions in Tamil about Correcting Smart card details online tnpds. Peoples where start complaining that there are more mistakes in the Smart card. There are more complaints about the address printed on the Smart Card. It is also necessary to check our details before complaining the government. We can check the Smart Card details and correct the mistakes online before it gets printed. This article will explain you about how to check the details and correct the details. Below is the step by step procedure for correcting smart card details online for Smart Ration/Family Card in Tamil Nadu. 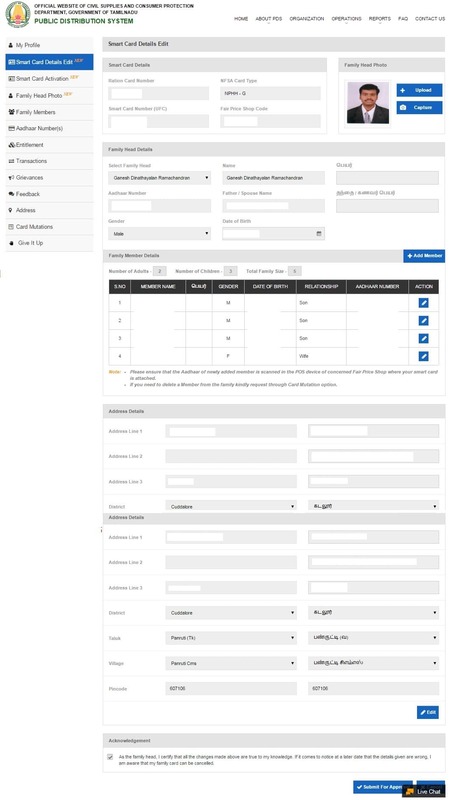 Click on “Beneficiary Login / பயனாளர் நுழைவு” on the top right side of the website. After clicking on this link, You will be directed to login page, where you can provide the register mobile number and click send OTP. You will receive one time password. Give that one time password and login to your account. Click “Smart Card Details Edit” on the left hand side. Check all the details were correct. If anything wrong click the edit option and change the details. Check the below image for the sample Smart Card Details. After doing all the corrections and submitting the required document. Click the acknowledgement to accept the corrections and Click “Submit for approval”. After submitting the corrections, you will be provided a reference number which will help you track the status of your Submission. if you are already applied. pls wait and check the website for updation. yes. if you have changes then you have to update both language.When you feed the details pls complete both language. Hi, Thanks for the tips. But just imagine correcting tamil translations of cards by persons not knowing how to do. They could have scanned the address also at the backside, when we gave them aadhar. It has taken nearly 2hours to edit. It is not easy, as every enclosure has to be sent as proof. Not only that every photo should be with in 10kb, and enclosures shoud be less than 100 kb. But when you normally scan aadhar card in small form, card form, it takes more than 140 kb. This you have to make it 100 kb, by editing and saving to required sizes. Imagine the no of entries one has to change, if the father name is spelt , as female gender name and every member is added with aadhar details of father in front. So, i do not think that it is easy to edit. Thanks for your tips. Thanks for giving your feedback.It is government procedure at least now simplified to do it in one place(on your computer)rather than making as to go here and there. but sure it is very painful job. I also conveyed a bug in their complaint form, which will not be submitted with the other of invalid format error. I tried so many tricks by removing even fullstops. I contacted their helpline and then it is now fixed. You could send any complaint now you are facing.Even submitting of 10 kb photo gives you pain. Unless, you have the expertise , you just cannot send the correct sized photos to be in Family Head Photo colomn. Particularly , i have used an online site for fixing this issue. Otherwise, either it may be too small or kind of extended display of photo distorting look etc. Complaints from issue I also faced but I corrected by myself by removing ” . , : ;” etc. Hi, I also gave a feedback of sort, to the department, to get the back page details of aadharcard from uidai, source, which could be just used for tamil translation for the first stage of correcting the details for smart card print. Normally, those may also have some corrections, but which does not need total correction of details as of now. I think you understand what i mean. In aadhar card you are having the details of your name, individual name and address, both in english and tamil. Almost the scanning process is over now. If they had scanned these details as well, when they scanned our photo and aadhar numbers, then this edit process woud have been sizably made easy. I am concerning about the masses at low strate of the economy who do not know much computer operations and they have to go the nearest browsing centres to do. The awareness is still to spread. Those who have known tnpds, would go there and edit but what about the others? Yes , you are correct, that one could correct the details from one place. But i think that this is limited percent coverage. Thanks for all valuable tips. I will give the online photo tool if you permit the link here. Thanks . If you are intetested to post some useful articles you are most welcome to post under user post. You can help others by spreading your knowledge. 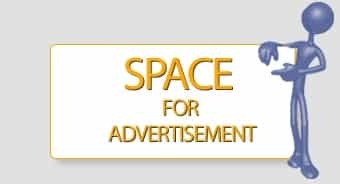 You can any article related to our website menus. Thanks admin. The useful link to reduce the photo size is given below. Pl check it before okay it. What is the advantage is once browsed and then select the width , you could easily adjust the new size to see the size of the file. Once you are sure that it gives about 9.95, which is less than 10kb, then you get the photo clear without any quality loss. Once you browse, it will show the two possible compressions in the figure in the link. Hi, Normally the picture if it is scanned , it would come to about 140 to 150 kbs in jpg format. This you have to make it to 10 kb without quality loss. So , i suggest that tool, which will be very easy. This tip is particularly useful for the persons who are self changing the details with their computer. I have entered details in the given site properly with right english names as well as in Tamil correctly. But when i received the smart card, the local language has messed up my name as well as all the family name is interpreted wrongly in tamil language. I think all the people who work in entering and printing the cards do not care about whether it is right or wrong. How to get the new smart card again with correct names of myself and my family entered in.? This is because they already printed some lacks of smart card without considering the online correction. Now go to nearest e-sava center to correct the mistakes are ask our ration shop person when they will call for corrections of smart card details. I requested for chnges and the reference number is 1495609444498. How to track position please? Just contact the toll free number and tell your number. Use this link to check the status of the correction posted. After correction how can we get the card with updated data.. Should we approach E-Sevai maiyam? Yes. It Will arrive to your ration shop. Hi, I could not contact the toll free number 1967 is temporarity out of order. You always get the words, the calls number is busy. If it gets to the number, then it just give you , your call is important to us and then closes automatically. Probably, so much persons are trying that number now. My name is misspped as Andhanan instead of Anthanan. I try to correct using tnepds app and also raise a ticket. But not solved yet. Kindly help to change the name. i am Archanadevi live in coimbatore.One week before i get a smardcard. That card Shows in my father name And My Name wrongly put it. Actually My father is N.BALASUBRAMANIAN ANd My Name is B.ARCHANADEVI.WRONGLY Entered in N.SUBRAMANIAN AND B.ARCHANA.Can you pls tell me any possible to correction in smard card. Hi, Admin, Please clear this doubt. Is it possible to get corrected cards , after online edition. There is a provision of print smart card option. Is this for printing corrected cards after verfification of proof by the helpdesk or officials . Once generated , i think , that it will be shown the details . Am i correct? Hi Mr. Raju I given you reply yesterday but just now I found my reply is not found there. Hi, I edited my photo as the last edit and then after few days went to the query no, to know updated information. I find that my application was successfully submitted and await tahsildar approval. Is it not automated process? i tried in vain to get the toll free number to clarify on this. I think, that translation to tamil will be faced by many people , to whom smart cards have already been issued or in the process of issue. Hi, I have modified family head and added a new name in the card and same has been approved, will get a new card or have to use the same smart card. I edited my family members details and sent for approval.Now it show your card is approved then what should i do now? Thanks for for your replay!! where this godwon id is asking? or correcting smart card details? check again and give me details..
i tried to remove a member from samrt card. but when i select the member and click sumbit it says Godown Id cannot be null. why is it coming so ? i tried to remove a member from smart card. but when i select the member and click sumbit it says Godown Id cannot be null. why is it coming so ? Any idea on the waiting timelines for each stage when applied for a new card ? … Is any such timelines published by TNPDS department ? hi. I have uploaded the photo and corrected other required details. But I could not find any tab like ‘save’ of ‘update’. Just I logged out from the website. Will it be saved and updated? How can I know that my card is ready? I also got the same err msg. I have sent a screen shot saved as PDF to you in the above FB inbox. yes.they are updating every day new things..and its giving more problems to the users. Activated card maybe the old one. No need to worry. Once you edit and correct the details they Will print your new card. But it Will take time. Mean while you can use old smart card. I made changes in smart card edit option . how many days will it take for approval ? If you recive msg your card not yet printed means your card is not ready. Try again after some time or contact your Ration shop for (godwon) ID number. Hi admin i need a favour. Without checking i activated it so my father name printed wrongly. “Godown id cannot be Null” error appearing while trying to add a member’s name. Hi, i did not find any error , if you logged as user.i already saw this error in some posts in this site. Thanks, I tried again. This time error did not come. Before I edited English as well as Tamil. But now maybe not possible. Go to nearest esava center ask them to update the aadhar card. You can update the new address.but you should have a address proof for that new address. We already get the smart card with some correction. Now i made the changes in online. How can we get the new card with correct information. goto nearest e-seva center and print your new card. My change of address has been approved but it is not reflecting in the main page why? I applied change of address updation thro online on 26/6. ID02170626816779.lapse of 50 days no steps has been taken to update. I sought assistance from all sources, all went in vein. Whether updation would be made? or as usual I have to leave the ration card. Be cool they will update it. Wait for it. You know about our government work. I have removed my name from our smart card online and due to some reason couldn’t able to process for new card. So I have added my name online again. It has been 21 days since i have added name. But still it is showing the status “Your Smart Card modification request has been processed successfully and waiting for Taluk Supply Officer Approval”. How long it will take to get the exact status whether accepted or rejected? We can delete or add new members online. But it Will take long time due to long processes. But the name has been successfully removed online that’s why I was try adding name online. The processing time should between 7 to 20 days. In my case it has been 21 days since I have processed. If the status shows “rejected” I can approach TSO. Bit confusing. Pls wait. It will take more than a month sometime. You can change your photo and print it from eseva center. Probably 30 -50 rupees they will charge. How long it will take to change address in tnpds site. How long it will take to change address in smart card through tnpds site. Is the smart card from esevai is valid and original or should we get it only from Ration shop? “Godown Id cannot be null” Error is a temporary error. Log off from the current browner. User Internet Explorer Browser (if you tried in the same browser earlier, then close and open. Then clear cache and try again). It will work. “Godown Id cannot be null” Error is a temporary error. Log off from the current browner. Use Internet Explorer Browser (if you tried in the same browser earlier, then close and open. Then clear cache and try again). It will work. Thanks Rajkumar. I was struggling with this NULL error with all browsers including EDGE. With your help I used IE and got through. TNPDS, it seems, has been designed for IE. Take a bow brother. In SMART CARD BELOW NPHH or PBHH Number mentioned .. wat number is tat?????? It will take more or less 1 month for some changes. I have changed my address from Avadi to vellore. Can I do this address change online. will the fair price shop also get changed? i corrected my details in smart card. when i get new corrected smart card. I have to change my address in the ration card. I live in Nanganallur. When I select Kanchipuram district, I am not finding Nanganallur in any of the taluks. What should I do ? When I enquired, they say Nanganallur comes under Alandur taluk. But it is not displaying when I select the Alandur taluk. Dear sir, it is better go to the nearest e-seva center and apply. I have updated the all details for smart card and got the reference no as well.. Normally, How long it ‘ll take to complete the request? My name is not included in the family smart card, as I have applied and got my Aadhar card at later point., So, I was trying to add myself to the family smart card and I am able to fill the details of mine as directed, but when I try to upload my scanned aadhar card, it is not a success., it keeps telling me aadhar document is mandatory.. Moreover my file size is less than 100kb ad is of pdf format., can anyone here help me to upload my details pls?? i have old ration card but not include aadhar and mobile no at the time of inclusion now card has been blocked pls give me a correct way to solve the issue . Hi did you get the reference number after you submit the corrections? My fair price shop number and the register number is wrongly printed on my samrt card.. How to chnage it??? Watch the video given in the article and change accordingly. If you are not sure then visit the nearest eseva center. My husband name is family head in smart card. How to remove the name and apply new card? I have added a member detail in online website. Can you please let me know approximately how long does it take to update a new member in online? it will take from 1 week to 50 days. I have changed my new residence address, but FPS code is still showing the old one even after three months. Can any one guide me? How to Change fair price shop code in smart card through Online..? hi, goto nearest e-seva center and change the FPS code. This is the best way to do it. approximately it will take 1 month for changing the address and shop no. wait for another 1 or 2 weeks and check online. if you received the changes then good otherwise contact the nearest e-seva center. how to correct the number of the cylinder in smart card..? Need to do correction in my mothers smart card. have to add the mobile number. what is the process to do ? kindly guide. My change of address is approved. Now approached e-seva Kendra for print. They are telling only web file printing is possible. But how to get my smart card printed in plastic card as original? Great post, I conceive people should acquire a lot from this blog its very user genial. I shifted to new address.How to change address in smart card? You can change online by submitting appropriate proof for your new address. You can print in E-Seva centre. i have updated my new address in the smartcard online , but still it shows the same ration shop nearer to my old address. How to change the ration shop which is nearer to my current address. where i have to approach for the same. Approch your Taluck Office/E-seva Center. 2 weeks before the option for Smart card details editing has been closed. Now you have to visit e-seva only. How to check URN Status Online? I applied online smart card bt verification no one came i am wait for 3 month i checked every week twice reference number in online verification protstage only showing. I TRY TO CHANGE OF ADDRESS ONLINE, AFTER COMPLETING ALL PARTICULARS GODOWN ID CAN’T BE NULL MESSAGE APPEARS. WHAT MEAN GODOWN ID..
TN smart card is showing all names in Tamil only. I need to submit this as a family proof and need to get it translated to English. Can you help me? Thanks for your great words. Happy to hear about this. most of the people getting benefits from our site. but they dont have a good heart like you to appreciate our work. bcoz appreciation give us to more strength to work. My smart card status is showing disabled.whats meaning for that.i applied the new. How to update information in smart card?